Efforts by the Bougainville Technical College to produce highly skilled graduates have been improved with the installation of a new industrial-strength generator. 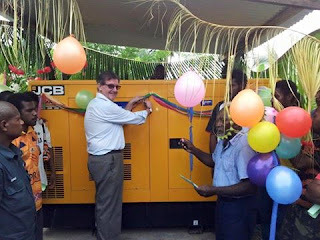 College Principal, Joe Beno and Australian High Commissioner, Bruce Davis, officially commissioned the 65 KVa generator that will provide 3-phase power to offices, mess, workshops and staff and student accommodation at the technical college. Mr Beno said the new generator would help the college to better deliver courses that would meet the skill requirements of industry, business and benefit the Bougainville community. “The new generator will provide the electricity the college needs to carry out training in areas like welding and automotive trades and carpentry, which consume a lot of power,” Mr Beno said. Mr Beno said the new generator would also benefit local communities. The generator installation included new wiring and electrical protection against lightning strikes, electrical faults and overloads. Staff and instructors were also heavily involved in its installation. Australian High Commissioner Bruce Davis speaking at the commissioning commended staff who assisted with the generator installation and congratulated staff involved in setting up the generator, highlighting this will support the generator’s sustainability. The generator was funded by the Australian Government in partnership with the Papua New Guinean Government.